Change of hART is a small jewelry and wedding flower design studio based in Wichita, KS. It is owned and operated by Jelena Louie, a Textile Design graduate of FIDM, Los Angeles, CA who, after attempting to make a name for herself in the realm of fine art (painting) and wearable art, had a change of heart and decided it was time to change the art form as well. She then apprenticed with a jeweler in Sitka, AK for two years. Jelena's branching into beaded and wire wrapped jewelry began in 2003, and she has drawn her inspiration from nature's bounty ever since. Techniques Jelena most frequently uses in her jewelry design are wire wrapping and wire knitting, metal stamping, knotting, and stringing. In her wedding floral designs, she combines fabric, feathers, beads, crystals, and rhinestones to mimic natural flowers "with a twist." Jelena was an active member of California Silk Artists group in Santa Monica, CA from 1999 to 2003, and Baranof Arts and Crafts Association in Sitka, AK from 2005 to 2008. 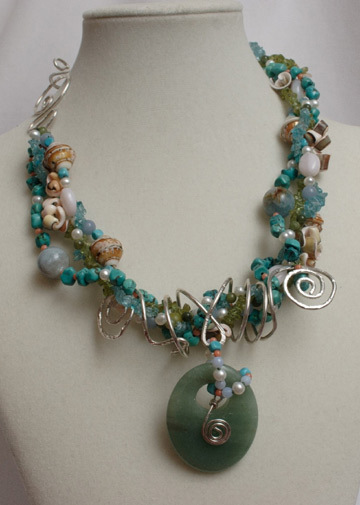 In 2010, she won the 1st place in the Jewelry category at the Halstead Fine Art and Craft Festival in Halstead, KS. She exhibited annually at Sitka Artisans Market and Baranof Arts & Crafts Association Annual Show and Sale from 2005 to 2007, as well as at numerous other fine art and crafts shows in California, Alaska, Kansas and Texas. Her jewelry was featured at Scanlon Gallery in Ketchikan, AK, Clayworks Gallery in Newton, KS, and currently some of her designs can be purchased at The Onion Tree boutique in Wichita, KS. Jelena's designs also appeared in the July 2010 issue of the Naked City Wichita magazine. Top: Sterling silver, gemstone, pearl, and shell multi-strand statement necklace, "Nautilus" This 4-strand, multi-gemstone, one-of-a-kind necklace sports swirls borrowed from the pattern of a nautilus shell. Heavy gauge sterling silver wire has been carefully wrapped and hammered to form a unique pendant bail and hook-and-eye clasp, while shells combine with multiple gemstones in a frenzy of ocean colored strands: turquoise, apatite, amazonite, aquamarine, and blue lace agate for water; peridot, serpentine, nephrite jade, and green aventurine for seaweed; pink opal and freshwater pearls for seafoam, and just a touch of pink coral to pull it all together. 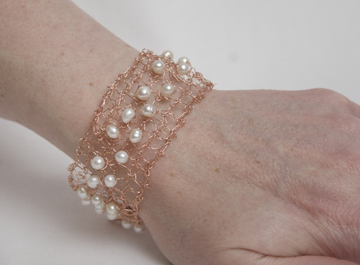 Middle: Copper wire knitted cuff bracelet with freshwater pearls, "Knit & Pearl"
A new twist on knitting, this one-of-a-kind cuff style adjustable length bracelet was made with genuine freshwater pearls on fine gauge copper wire knitted by hand on regular bamboo knitting needles. Very light weight, unique, and elegant. Fits wrists from 5.5 inches to 7.5 inches in circumference and closes with an adjustable copper toggle clasp. Bottom: Sterling silver, gold fill, and multi-gemstone opulent necklace, "Citrus Punch" This elegant, opulent, one-of-a-kind 18 inch necklace features a large faceted carnelian drop pendant with carved carnelian flower and a mixture of gemstones: garnet, citrine, peridot, and carnelian combined with freshwater pearls. Wire wrapped links are made from alternating sterling silver and gold-filled wire. 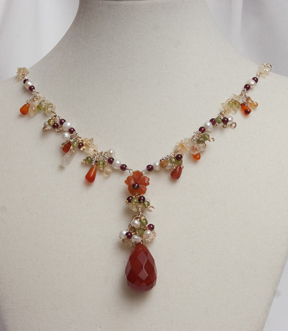 Necklace closes with a flower shaped sterling silver and citrine clasp. Stunning... her jewelry is just stunning, thank you for introducing me to Jelena! That Nautilus necklace is gorgeous. Really like Citrus Punch, too. Wonderful jewelry. These are really stunning! Every time I try to crochet or knit wire, I end up with a big twisted ball of wire and beads. It's not that easy!! Looking at these photos makes me want to try it all over again.